I used to joke with friends that one day I would have a baby just so I could dutifully create the most perfect nursery for my lil minion. I not so secretly wanted a girl because I was of course drawn to the decor of little girls’s nurseries moreso than those of boys. I got lucky. When we first learned I had a little olive in my tummy, long before we found out that she was in fact going to be named Olive, I had decided that if it was a girl I wanted to have a vintage mermaid theme. And if it was a boy I wanted robots to be the main attraction. Then 20 weeks came along and IT WAS A GIRL. YAY. And my dream of having a vintage mermaid abode for my lil precious turned into her nursery comprising of mostly “under the sea/mermaid” theme but also “cute things.” There was no way I could turn down this little, yellow fox our friend bought us on etsy.com. Or some of the other toys and mementos from my childhood that I knew had to be part of her room. 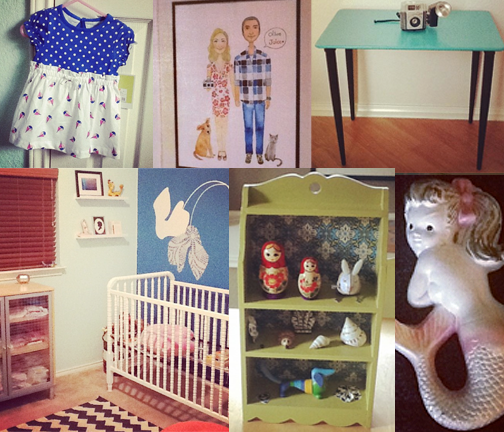 Her room is bright, colorful, vintage, and ALL THINGS CUTE. And you can imagine how stoked I was when it was featured on Apartment Therapy!!! 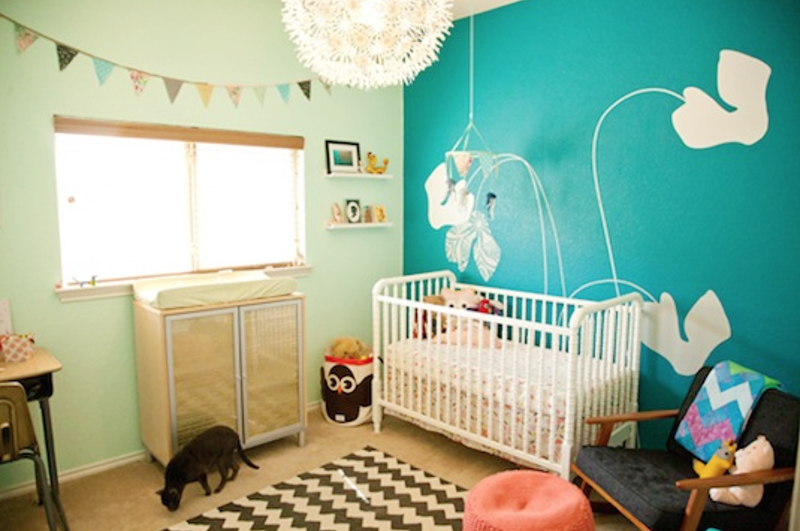 My main inspiration was this nursery, a nursery one of my favorite bloggers put together for her little girl. This blogger blogs primarily about nursery design and puts together nursery mood boards on the regular for me too “ooh” and “ahhh” over every few days. 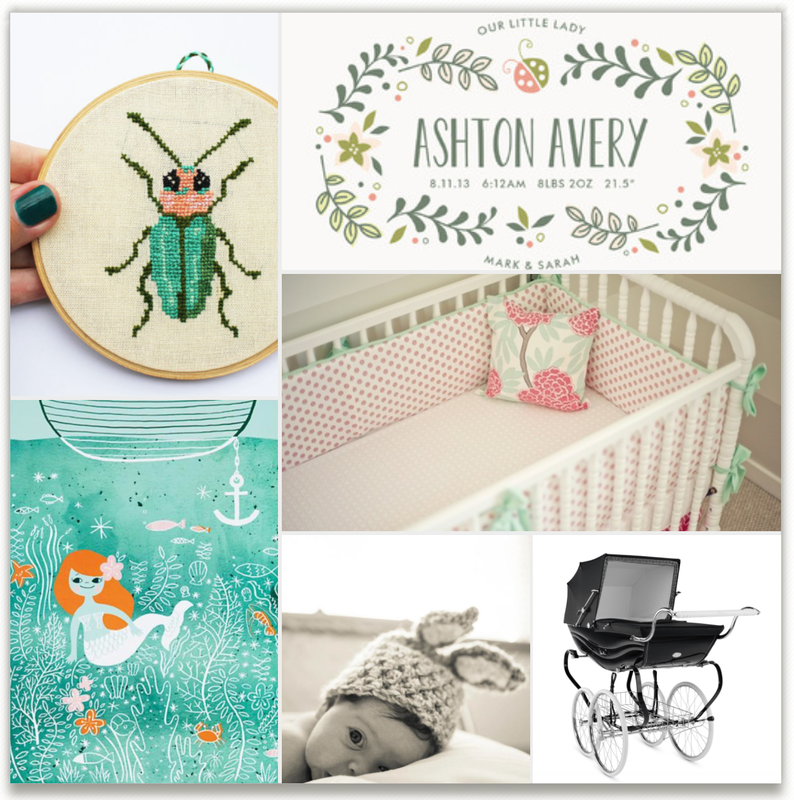 Too bad I didn’t come across these two mermaid inspired mood boards until just a few weeks ago. They would have been the perfect resource for me. In any case, I’m super excited to have Olive’s room grow with her as she becomes a big kiddo and beyond. I find things I would love to have in her room daily and have been working on refurbishing the very dollhouse my mom made for me. 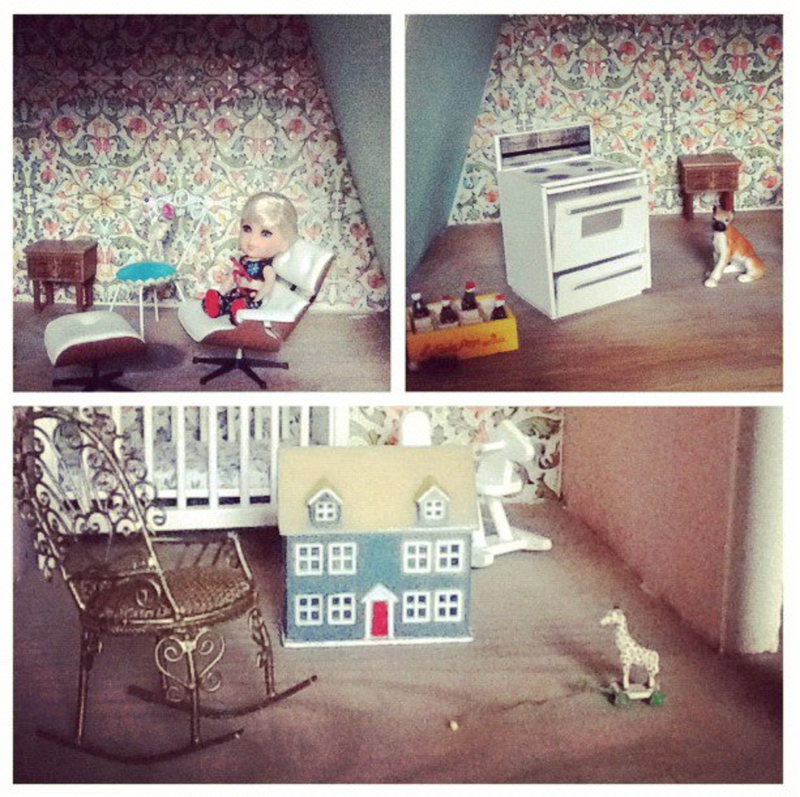 I’ve painted it, wall papered the walls, and am slowly filling it with vintage dollhouse furniture. Hopefully she’s a responsible kiddo that takes care of it and appreciates all the hard work and MONEY I’ve put into it so far! 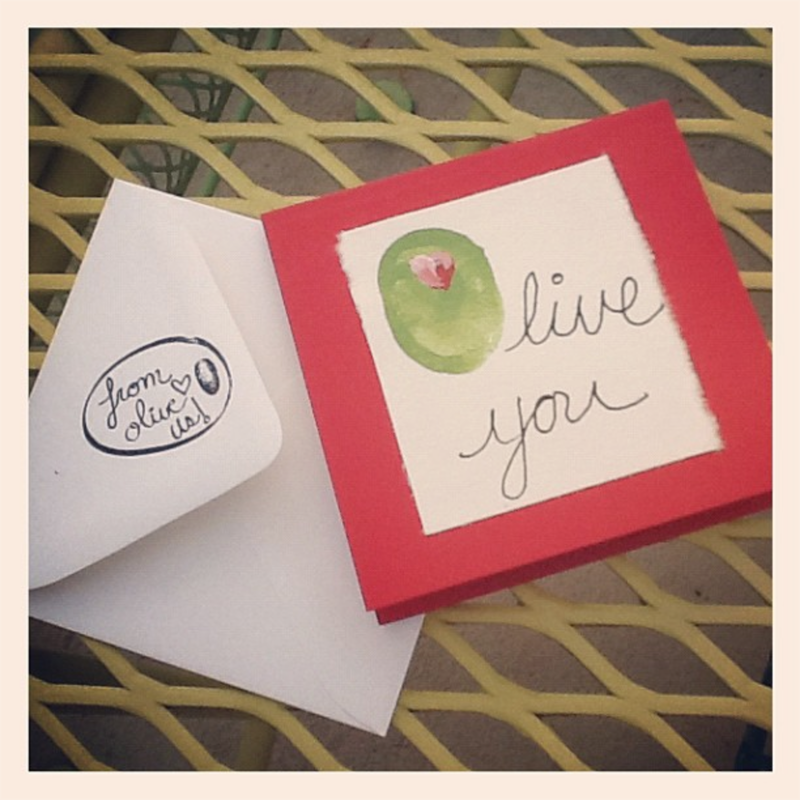 Are you listening Olive? Play nice!!! I’m a little slow catching onto trends. Like the totally awesome neato thing where you make your own gifs and then share them with the internet. So I’m catching up for lost time. Here is a gif about Olive’s favorite TV show GIRLS. 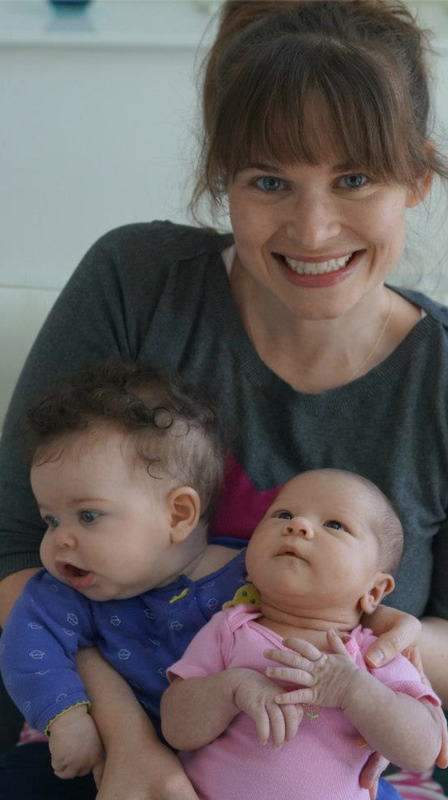 It’s not exactly age appropriate but she’s far from forming memories, so we’ll just continue to watch Hannah Horvath trot around Brooklyn nakedly. And here’s one about mustaches. Olive has no interest in facial hair…but I do. Along with the rest of the internet. Many more gifs to come because they’re like so much fun. Alex bought me a way cute necklace that got delivered today to our front doorstep. I asked what the occasion was and he told me how proud he was of me for the job I’m doing raising Olive and for all the work I’ve done trying to get our photog business off the ground. Most days I just feel like I’m not doing enough. Well I should say…not doing enough of the right stuff. Life is all about making decisions. And in this case I’m wondering if I’m making the right decisions on how I should spend my time each day I’m home. Should I spend my time emailing this guy about this gig that doesn’t pay well but could offer some good business exposer? Should I spend my time designing another flyer that I can pass out to people that are more than likely just throwing it away. THEY BETTER AT LEAST RECYCLE IT. 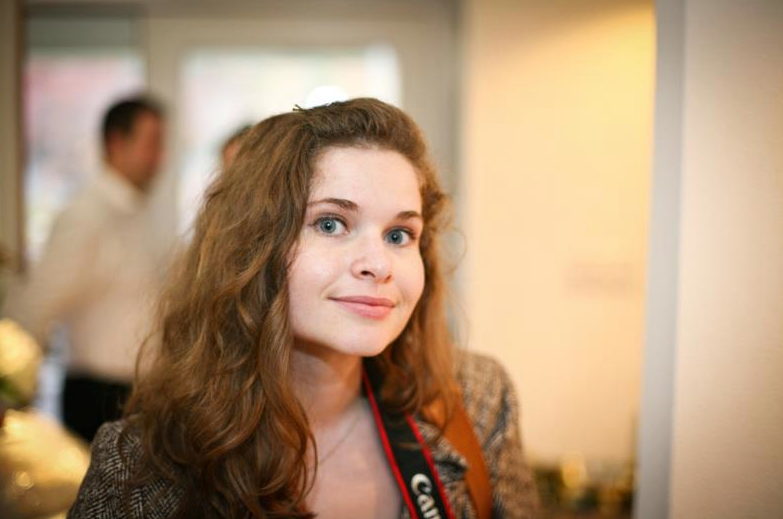 How do I small business? When I was in art school I took an oil painting class. I loved it. Most of it at least, one time I was cleaning my glass palette with a razor blade that my professor handed me with one instruction, “Don’t cut yourself.” You can guess what happened next…oh the horror. I loved getting into the groove of a painting, I just hated all the setup and cleanup. And I really hated sitting in my dorm room, clear on the other side of campus, wondering if I should go into the studio to work on whatever painting it was I was working on that week. Odds are I’d be able to finish it in time if I didn’t go in on the weekends to make little dabs here and little dobs there. But the point was it made me feel better to go in and go through the process of being a good student and being a better painter. That’s kind of how I feel these days with this whole small business thang. Even if I go and sit at my computer and send off emails that probably won’t get responded to and design flyers and headers and business cards that probably won’t make that much of a difference it feels good just to be there, sitting there trying to make something happen. Rather than sitting on the sofa with Olive dreaming up epic to do lists. Oh the thinking of the to do lists. Since being laid off I’ve been enormously happy and relieved. I’m no longer sitting at a desk wasting my time at a job that I am thoroughly bored at. I also have a boss now that I LOVE LOVE LOVE. Her name is Olive and she’s currently propped up in her bumbo with leopard footy pajamas and a binky with a purple cat on it. My days aren’t nearly as scheduled as they were a mere month ago. They consist of naps (sometimes for both me and Olive), me checking my email, Olive crying that she’s bored, Saci letting me know that she too is bored, and just hopefully doing some of the stuff that is required to get a small business off the ground. I’m not making huge paychecks right now. BUT I’m making like ginormous happiness paychecks that I cash in on daily and everybody around me is probably a wee bit happier because of that too. 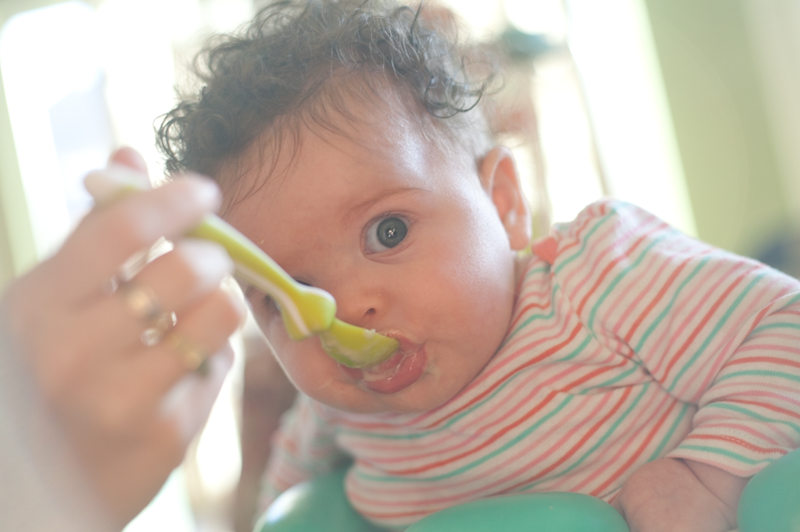 Also, it’s spring in Austin and I have a happy baby girl who now eats solids. 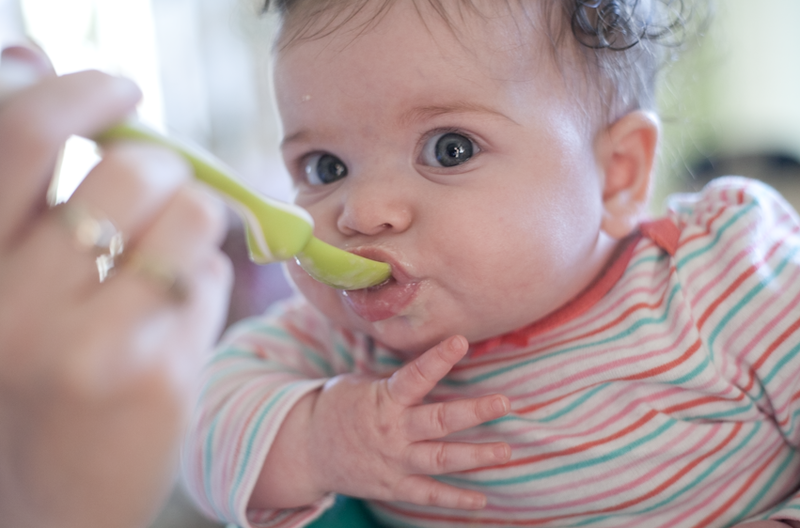 photo credit goes to first time parents Chris and Subina Garyet. That’s me and Olive enjoying their new bundle Ashni! !